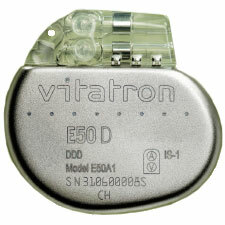 At the completion of the 30-minute Implant Detection period, Rate Profile Optimization is enabled; the appropriate pacing and sensing polarities are automatically selected by the device; Atrial and Ventricular Output Management is enabled and Amplitude and Pulse Width become adaptive. Sensing Assurance™ is enabled and Sensitivity becomes adaptive. Reduced VP™+ is enabled 60 minutes after Implant Detection is complete. b Tolerance for amplitudes from 0.5 V through 6.0 V is ± 10% and for 7.5 V is -20/+0%. Tolerances are based on 37°C and a 500 Ω load. Amplitude is determined 200 μs after the leading edge of the pace. c Conducted AF response is functional during Mode Switch episodes, VVIR, and VDIR modes. * DDD, 60ppm, 100% pacing, ventricular 2.0 V,† atrial 1.5 V, † 0.4 ms pulse width, 1000 Ω pacing impedance. ** Reduced VP™+ ON 50% pacing.